Rent pretty 2 rooms downtown, 50 m sea, air conditioning, wifi, neat, closed garage. Standing building, 4th floor, new air conditioning, new bedding, neat. 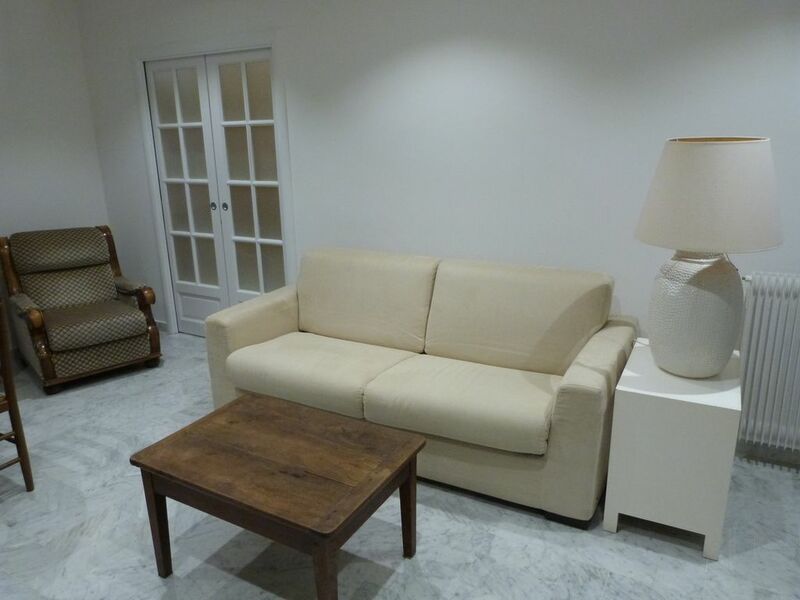 Apartment very well located in the city center, 50 meters from the beach and close to all amenities. Secure luxury building, quiet area, lift the standards. 4 th floor with large terrace. Ravallement of ĺ'immeuble was made early 2016. This apartment in the city center includes an entrance, a large living room with a quality sofa bed, a large bedroom with a double bed 160x200. Lots of storage space, wooden floor, fitted kitchen. The terrace is sunny. The marble bathroom with a large walk-in shower installed in 2015 and a washing machine. Air conditioning for comfort. It is very difficult to park in Menton, a garage is available in the basement of the building (included in price). We stayed here for 2 weeks on our first trip to Menton. The apartment offered everything & more than was advertised, was the cleanest we've ever stayed in, and is in a fabulous location. Helena was a treat. She greeted us with welcome gifts of eggs, herbs, and lemons from her garden, was available if we had any questions, and was invisible when not. The apartment was clean down to the corners and well furnished with a lovely new, roomy bathroom and shower. The kitchen was well supplied, even with a cheese grater, garlic press, and cork screw - everything needed for a perfect self catered holiday in France. The location was ideal, close to the sea, various vegetable, meat, and fish markets, various restaurants, many tourist sights and buses for travelling to interesting mountain villages, and close to the train station for day trips to Ventimiglia, Nice, and Cannes, and for our transfer to Paris. The apartment's balcony faces east, giving morning sun for breakfast and shade in the evening. We won't hesitate to recommend this apartment to friends and will certainly stay here on our next trip to beautiful, friendly Menton. Dear clients, you are so kind to send your appreciation so sweet. My clients are my family and friends, I try satisfied them and if they spend a happy stay it is for me a grate satisfaction to participate descovering a little bit of so beautiful Menton! Gute Lage, nette Vermiterin und saubere Wohnung! Wunderbare Lage. Sehr freundliche Begrüßung.Die Vermieterin ist sehr freundlich und hilfsbereit. Alles sehr sauber.Die Einrichtung ist vollständig. Idéale pour un couple avec un enfant en bas âge. Sans oublier une assistance et les produits de saison du jardin de la propriétaire en cadeau de bienvenue. appartement très propre, très soigné. PROCHE DE LA PLAGE ET DES COMMERCES. PROPRIETAIRE TRES ACCUEILLANT ET TRES SYMPATIQUE. Les tarifs sont charges comprises (eau, électricité, chauffage) Le ménage de fin de séjour est non inclus, mais vous pouvez choisir ce service pour 60 euros. Possibilité de location de draps. Une caution de 300 euros est demandée, et remboursée à la fin du séjour après l'état des lieux. Possibilité de dégressivité de tarif sur les longs séjours. Séjour minimal 4 jours.